Some of my kitchen classics – what are yours? 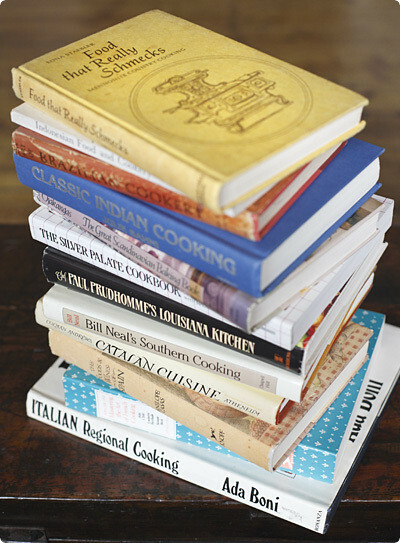 Here’s a question for all you cookbook-hoarders out there: if you were forced to reduce the number of books in your possession, and you were allowed to keep either your books that are at least twenty years old or those that are less than ten, which ones would you keep — the old or the new? I imagine for most people that’s a pretty easy choice: the new ones, of course! Old cookbooks are staid and stuffy and full of recipes featuring cocktail wieners and salad cream. New ones are pretty and glossy and full of the kind of fresh, exciting, modern food we all want to eat now. Right? I posed that question to myself a couple weeks ago, after our last discussion on cookbooks when I told you about how I was going to try to cook more from my under-used ones. Well that got me thinking about which of my cookbooks do get used and why, and from there I started thinking about whether usefulness and value are one and the same thing (it a nutshell: no, not for me!). That, of course, set me thinking about which of my books I would keep if (horror of horrors) I was forced to choose between them, and to my surprise, I came to the conclusion that as much as I love all that gloss and glamor, if push came to shove my older books just might have the edge. There are certainly a lot of books out there that I would reject because their age. I’ve bought several over the years, in fact, which sounded great in theory, but ended up being so dated that not a single recipe appealed to me (compilation books from newspapers and magazines have been particularly prone to falling short of my expectations). But then there are other books that are twenty, thirty, even forty years old that I couldn’t imagine life without. To me, they’re simply classics. What makes a book a classic? For me, a classic book has to be timeless in its appeal. It avoids the pitfalls of overusing trendy ingredients or techniques, although a certain amount of this is certainly forgivable (and unavoidable). Classics are also approachable, well-written and most importantly reliable, something I find sorely lacking in many of today’s ghost-written celebrity-chef-driven offerings. The majority of my own personal classics, I’ll admit, are books about other cuisines. In contrast to today, the authors of decades past often spent decades researching and writing these books, and many of them contain a truly staggering level of scholarship. Books about other cuisines, I find, are also less likely to seem dated (apart, of course, from the inevitable ingredient substitutions, which are usually pretty easy to work around), since most traditional cuisines around the world haven’t changed much in the last half-century or so. If anything, they were probably richer a few years ago, when more mothers and grandmothers were still cooking them and McDonalds and pizza hadn’t yet colonized the globe. One of the things I love most is discovering new classics—books I’d never heard of but can’t imagine living without once I have them. One of my newest entrants in this category is the book you can see at the top of the stack above, Food that Really Schmecks by Edna Staebler. Do you know this book? If you’re Canadian, I bet you do. Edna and her series of Schmecks books are an institution north of the border, and when she passed away in 2006 at the age of 100 the country lost one of its best-loved food writers. I discovered her books quite recently, when a passing reference to them online woke the linguist in me, ‘schmecks’ being an anglicization of the German verb ‘schmecken’, to taste. I was fascinated to learn that this is (or was) a common term among Ontario’s Old-Order German-Mennonite community, whose simple, farm-fresh food Edna decided to document in her books, the first of which was published in 1968. I was even more fascinated by the number of reviews I found, once I started looking for them, that rank Edna’s books among the most valued and beloved cookbooks of all times. As soon as I had a copy myself, though, I understood; within an hour of it arriving by mail, I had ordered her second one too. By focusing on the Mennonites and their cuisine, Edna (who was not a Mennonite herself, but lived surrounded by them in rural Waterloo County) created a collection of recipes with timeless appeal. That’s because her Mennonite friends, whose lives and kitchens she installed herself in to collect recipes, very much practiced the kind of farm-to-table cooking that we’ve lately been rediscovering. For the Mennonites, fruits and vegetables were either fresh from the garden, pickled or dried, meat was hand-reared and minimally processed, and the dairy products were rich and abundant. Butter, sour cream, bacon and brown sugar gilded everything. It’s not trendy or cosmopolitan food, but it’s deeply appealing in a rustic, elemental way. What’s more, these are absolutely delightful books to read. Edna’s own personality is larger than life, and her chapter introductions and headnotes are full of witty, charming and hilarious anecdotes. Reading them, you can’t help but wishing you could have been one of the endless number of people she was always having over for dinner, or one of her even-luckier nieces and nephews. Before you know it, she feels like your oldest friend and you’re trusting everything she says; when you read headnotes like “sometimes I think this is my favorite of favorites” or “watch out—this one will make you a compulsive eater”, you start turning down page corners. There are admittedly chapters in these books that I can’t really ever see myself cooking from. Her savory recipes show a lot of age; I looked in vain through her first book for a single recipe calling for garlic and came up empty. She also doesn’t shy away from ‘modern’ convenience foods in the many non-Mennonite recipes she collected from family and friends, things like ‘chicken-potato chip casserole’, ‘schnitzel stew’ (with ketchup) and ‘ham loaf’ (with pineapple!) which sound rather like they belong in the punchline of a bad culinary joke. It also struck me how often she freely admits that she’s never actually made the recipe in question, just sampled it at someone’s house and printed it as it was told to her. Some dishes she even admits to never having so much as tasted(! ), but as long as they came highly recommended from a trusted source she had no qualms about including them. How cookbook writing has changed! But everywhere else, the recipes gems are just falling off the pages, for everything from crunchy summer pickles (crabapples; fresh corn; cantaloupe), sweet fruit and vegetable preserves (tomato butter; carrot marmalade; gooseberry relish), homemade breads (oatmeal-molasses; apple-cheese-walnut; buttermilk-scone loaf), fried things (potato doughnuts; peach fritters), cookies (ginger crinkles; butterscotch macaroons; cheery cherry bars), luscious pies (green tomato; fresh raspberry; sour cream-raisin-walnut) simple cakes (chocolate chip-date; maple syrup; rhubarb upside-down) to even beverages (at least a dozen varieties of homemade fruit and flower wines). These oatcakes called to me the minute I laid eyes on them. Not because of any fondness for the original Scottish ones—which always brought to mind compressed sawdust—but because these looked exactly like what I always wanted the Scottish ones to be. Turns out the Scottish immigrants to Cape Breton in Nova Scotia shared my view; their transplanted oatcakes became richer, sweeter, a thousand times better than the original. Somewhere between a cookie and a cracker, they’re sweet enough to satisfy a sugar craving, but also savory and oaty and not out of place under a piece of cheese, say, or a smear of jam. In fact, if I were the kind of person to keep a cookie jar, these oatcakes are exactly what I would stock it with. They’re perfect everyday cookies: crumbly and rich, with a toffee-like note from the brown sugar and an addictive salty edge, but—and this is a big but—also restrained and modest enough to not play Russian roulette with your willpower (which is the main reason I don’t have a cookie jar). If the word ‘compromise’ didn’t have such negative connotations I’d say these oatcakes are the perfect embodiment of the concept: a delicious middle ground between austere wholesomeness and unbridled decadence. And I daresay they’re proof, if any were needed, that good taste never goes out of date. What makes a classic cookbook for you? What are some of your favorites? *On this topic, I have to ask: am I the only one who wants to throttle cookbook reviewers on amazon who give a book bad marks for not having photos? For me nice photos are certainly a plus but they’re by no means essential, and I would never not buy a book because it lacks a few pretty pictures. Dishes never come out looking like them anyway! Edna’s original recipe calls for lard or shortening, but since vegetable shortening is something I don’t much believe in, I decided to make half a batch with lard and half with butter. The results were strikingly similar. However, both of us decided we liked the ones with lard slightly better. They had a kind of savoriness that the others lacked, and seemed to keep their crunch better after a couple of days. They also seemed a little saltier, probably because the lard’s lower water content didn’t dissolve all the crystals. You could probably amplify that effect with either kind of fat by simply using a coarser salt, or sprinkling a little flaky salt on top before baking. Or, thinking about it now, you could clarify the butter to get rid of its water (chilling it again, of course), which should give you all the lard’s textural benefits. Ooh, and while you’re at it, why not go one step further and brown it? Oh, yum. Preheat the oven to 350F/175C. Combine all the dry ingredients in a bowl. Work the lard or butter in with your fingers until everything is homogenous. Add water, a tablespoon at a time, kneading with your hands everything comes together into a stiff dough (you’ll need a little more with lard than with butter). Divide the dough in half and roll each half out on your work surface to about 1/8-inch thick (3-4mm), using plenty of oats on top and bottom to prevent sticking. Sprinkle the surface with a couple pinches of flaky salt, if you like. Using a large knife, cut into 2-inch (5cm) squares. Gently transfer the squares (as well as the inevitable ragged edge scraps, which are the cook’s treat) to parchment-lined baking sheets and bake until fragrant and deep golden, about 12-15 minutes. Cool completely on a rack and store in an airtight container to preserve their crunch. What really makes a cookbook classic for me is ease-of-preparation. I hate those cookbooks that teach you to do a million things with brownie mix, though, because I cook to eliminate processed foods as much as I can. But a cookbook that tells me how to quickly and efficiently use whole foods to create a delicious meal? That's a real classic to me! I would definitely keep the new ones, because I have very few old cookbooks. I could get pretty far with just "How to Cook Everything". I learned to cook from that book and by watching "Good Eats". Recently I bought "Mastering the Art of French Cooking" (a happy byproduct of Borders going out of business was that it was $20) and I'm really excited about it.I value variations a lot. Give me the base recipe for pork chops, then show me: with applesauce, with sauerkraut, with dried cherries, etc. "How to Cook Everything" and "Mastering the Art of French Cooking" both excel in giving master recipes and plenty of variations. I don't need photos. Both of the books I referenced have pencil drawings, but no photos. Photos are nice, but not essential. Oh, my! I'm usually the perpetual lurks-and-never-comments type, but I just have to say how thrilled I am to find out you own Food That Really Schmecks. I'm from Edna's hometown, and it's so exciting to find out that someone elsewhere in the world has actually HEARD of her. You have to use lard for her recipes, though. It's not proper pseudo-Mennonite cooking if you can't fluster your out-of-town friends by telling them they just ate cookies made with lard. None of my cookbooks are more than ten years old, but I think that's because I only started purchasing cookbooks last year.In the long run, though, I would rather keep the cookbooks I'd owned for longest. I find that I'm the sort of person that likes to stick with certain recipes and make them many times over, and make notes and changes to them. That's a lot of the charm of having cookbooks for a long period of time—you get to make them your own.My dad has a large collection of cookbooks and the best ones are the ones with post its coming off of half the pages and pencil marks over every ingredient list. Those are the ones I would keep. I love the "Kochbuch der Büchergilde" by Grete Willinsky from 1958. Although there are things like cocktail sausages or "Schinkenröllchen" with canned asparagus and Mayo, it is an amazing source of phantastic German and Austrian recipes, especially in the baking chapter where you are told to mix your dough for half an hour with a wooden spoon or to use 12 eggs.I would always choose this one if I had to, even if it says that "Italienischer Salat" has to consist of tongue, salmon, salami, capers, olives, beets, mayo and apples. It shows the (bewildering) fashion of food and collects real classics at the same tim. These look great (your photography always inspires me to get back into the kitchen). I think I'll try them with 1/2 graham flour + 1/2 AP! What will make one of my cookbooks a classic is surely the story behind it, the ability of the writer to catch my attention beyond the recipe itself. I think to Julia Child, Jane Grigson or MFK Fischer: all writers and cooks, all able to tell a story and to teach you how to cook things. They are a bit narrative books and they will be as classics as any other literary genre. I swear you are in my head right now. Before I had read your last post, I too was lamenting the fact that I wouldn't possibly ever be able to make all the recipes contained in my cookbooks. Your post gave me renewed hopes. Just this weekend I started reading through my old cookbooks trying to unearth treasures. I found my grandmother's home economic book from the 1930's, and it is extremely entertaining. I would definitely keep my old books. I could never pick between the two. Old or new, for me, the test for keeping a cookbook is always whether there are least 2 recipes I want to make again. Of course, that means the bookshelves are groaning… Glad to see a Bill Neal book in your stack—his "Biscuits, Spoonbread, and Sweet Potato Pie" is one of my favorites even though I seldom cook Southern. I always enjoy your blog. Thanks. I already chose.I chose old.I have exactly 2 cookbooks in my house. An old Bettey Crocker, and a kids cookbook for nostalgia. Got rid of all the new ones a couple years ago. Yes, I'm Canadian and I definitely know Food That Really Shmecks! But my favorite Canadian cookbooks are any put out by Canadian Living (always reliable and delicious) and the Company's Coming books, which feature a few recipes like "ham loaf", but a lot of simple basics. I love oatcakes! I fell in love with Patterson's olive oil & black pepper version while studying abroad in England. From the ingredients list, I concocted a version for myself when I got home – quick oats, water, olive oil, salt, and pepper – because the recipes out there had lard or shortening, and like you, I preferred otherwise.My first cookbook was Kids Cooking: A Very Slightly Messy Manual (still have the color-coded measuring spoons that came with the book! ), which will always have a special place in my heart. I discovered the 1976 edition of The Joy of Cooking in a sixth-grade obsession about crêpes, and it has stayed in my kitchen, although others such as The Art of Simple Food have come to join it. Considering that all of those are graced with illustrations rather than photography, I'd like to ask the grumblers: Where is your imagination? I love Maida Heatter. I find the drawing by her daughter charming, and Maida Heatter writes so well, her descriptions are so captivating and her directions are so clear that photographs are nearly irrelevant. But her book covers have pictures of the desserts on them (with a code explaining what's what on the inside back flap), and that is helpful, too.Why is her work classic? All you have to do is read her books and you will see how timeless her desserts are. What a treat to see this post! I must agree with Beth: Jean Pare's Company's Coming are favourites and I love my Schmecks books. Just reading how Edna would make casseroles out of hotdog wieners and cans of condensed soup is pure enjoyment. But many of her recipes are absolutely wonderful and her stories are even better. I wrongly accused my fiance of losing one of my precious Schmecks books in his cookbook collection (he has 300 so far) for weeks before I finally found it buried on my bookshelf. Almost called the wedding off! I wanted to let you know, I could care less whether or not a cookbook has pictures, but my main requirement is that it has some sort of story attached to the recipe. It can be a story about how to make it, how it was tested, where it came from, really anything like that. Those are my favorite cookbooks. I love Elizabeth David's cookbooks from the 60's. For a start the prose is wonderful. So are so many of the recipes and the background she describes. As a student I bought an old Penguin paperback of French Provincial Cooking and still refer to it often. She turned me onto anchoiade, home made mushroom soup thickened with bread, and pretty much taught me how to cook.My other go to, this one newer with plenty of pics, but a classic downunder, is Charmaine Solomon's The Complete Asian Cookbook. Authentic recipes from a variety of countries, and I've never found a dud recipe yet.I prefer recipes with real ingredients, not a packet of this pre-made stuff and half a can of that chemical-soaked product. And BTW I love your blog. Thank you. Thinking about it, and excluding handwritten family recipes, I could probably get my collection down to just one. The only cookbook I could never give up is Alice's Restaurant Cookbook. I grew up in a family of excellent cooks who liked to take over the kitchen and have you set the table. So, while I love good food and know what I like, I didn't get a lot of hands on training when I was younger. Alice gives you meat temps, popular herb combinations, and a lot of friendly, calming advice. Her theory is that if you tell people what dinner is, and that it's going to be fabulous, then they will generally just take your word for it. Having her charming, laid back voice in the back of my head makes dinner parties possible. Also, I would point out that in my area chicken and potato chip casserole is still considered a legitimate foodstuff. I think I would have to keep the old, passed down cookbooks. There's something nostalgic about having those old dusty books sitting around. Besides, I have enough of a collection of recipes from blogs and other sites that I don't need many of the new ones. My fourth copy of 'Let's Cook with Nora' by Nora Daza, a Filipina restauranteur who opened the first Philippine fine dining restaurant in Paris in the Seventies. Her cookbook was utilitarian: slim, no photos, two-color line drawings, done in newsprint or the fancier book paper with a coated cardboard cover. But, it contained the recipes of all the special-occasion dishes I remember from my childhood including Lengua de Champignon and Callos (tripe stew). My first copies had been used and borrowed and passed around so often, they ended up lost or wavy from one too many kitchen spills and oil spatters. What I love about Nora's cookbook was how faithful it was to the memory of the taste of my childhood. Just do what it says and don't deviate. And though I went through a cookbook-buying phase a few years ago, I still repair to Nora's modest volume (on its nth printing, in fact) to plan my Christmas menu. Oh.my.gosh these oatcakes are good. I used half butter, half lard and they turned out really well. Thanks for this recipe. I use cookbooks to give me ideas as well as for the directive nature of them. I keep a mix of old and new; and don't know how I would choose! I do, however, like a cookbook to have pictures. I realize that it doesn't always turn out that way but I like to have something to aim for! For me; no pictures = not coming home with me. Cheers! Ah yes, I have that Food that Schmecks book too…I bought it many years ago in a health food shop in Ottawa Canada. I brought it to the UK with me when I emigrated 20 years ago. A few years ago, I pared down my cookbooks to a dozen or so. Some classics and some new ones. In April, I moved to Turkmenistan (Central Asia) for work. I was only allowed a small amount of stuff to bring with me, so I had to be very choosy about what I packed. I ended up with four cookbooks: 1) How to Cook Everything by Mark Bittman, 2) The Best Recipes by Cooks Illustrated (the first version) 3) The Cake Bible, and 4) the Pie and Pastry Bible by Rose Levy Berenbaum.So far they haven't let me down. 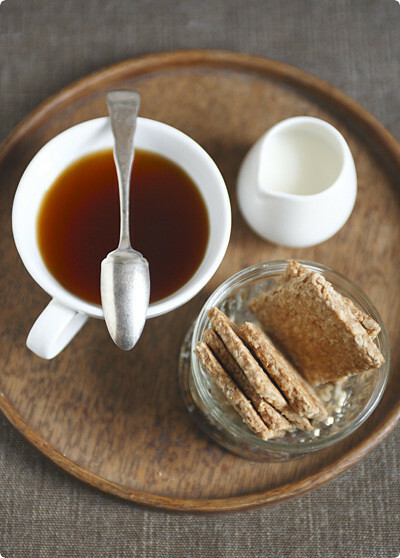 I love Nova Scotia oatcakes, and am so happy to see a recipe for them! A couple of years ago, on a road trip, I discovered they were sold in the eastern branches of a nationwide coffee shop, and they definitely fueled the ride. The recipe is similar to the Digestive biscuit dough I have chilling in the fridge right now. I have so many cookbooks that it's hard to choose. I refer to any of Alford and Duguid's often, along with Rose Levy Berenbaum. That takes care of savoury and sweet for me. Oh, you want to give Paterson's oatcakes a try, very savory, lovely taste and made locally.Great post! I was just given copies of Italian Regional Cooking and Catalan Cuisine (the product of someone getting rid of old cookbooks…) so I was intrigued to see them among the "classics" in the photo at the top of the post.I have not had a chance to cook from either of them. Are there any recipes in them that I should not miss?